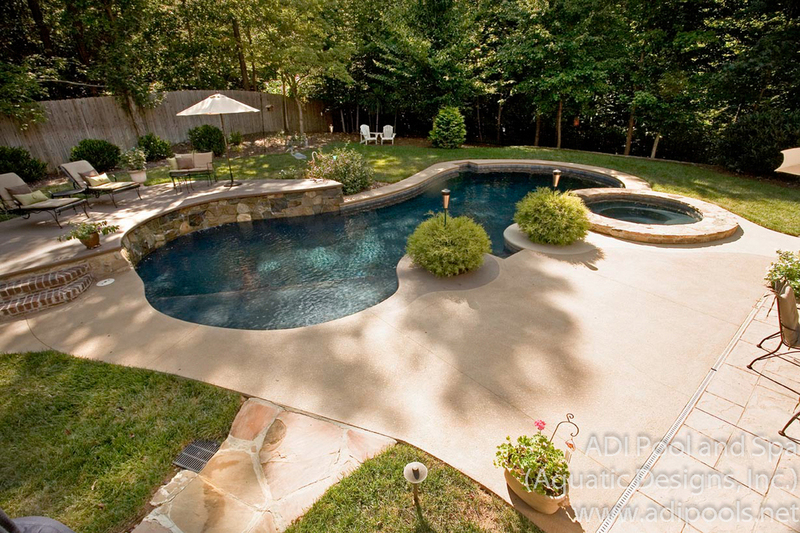 This beautiful formal swimming pool is in Lewisville, NC near Winston Salem. 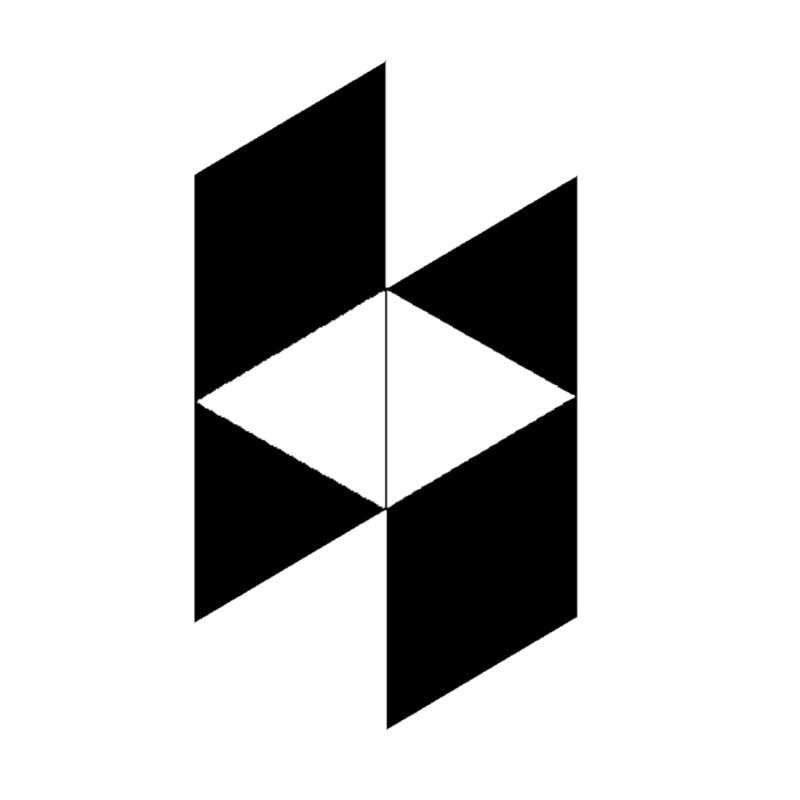 This design incorporates a raised brick wall with three sheer descents that fall into the pool creating a relaxing murmur of falling water, multiple underwater benches that provide ample space for entertaining and a raised spa with spillway creating a spot to relax and enjoy the sound of falling water. 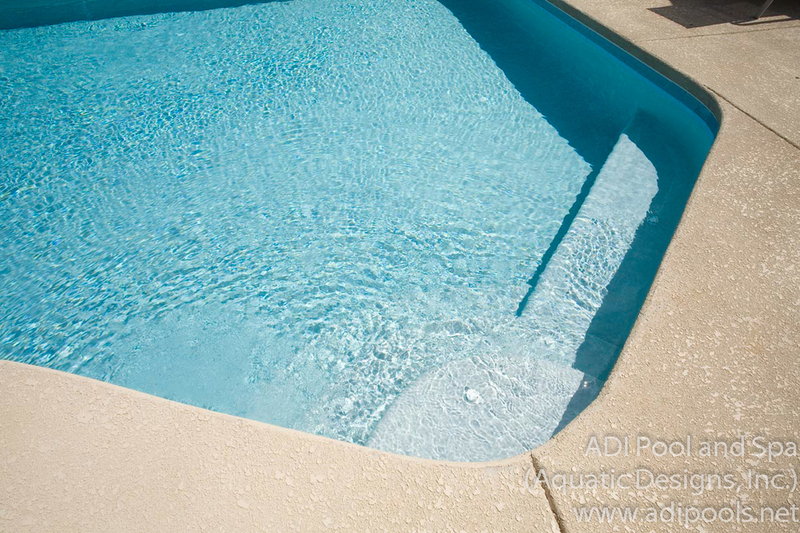 This project also features an automatic in floor cleaning system that is almost invisible, colored LED lighting, multiple variable frequency drive pool pumps for the best energy efficiency, and automatic water fill device, and complete automation with a handheld remote for one touch access to all pool features. 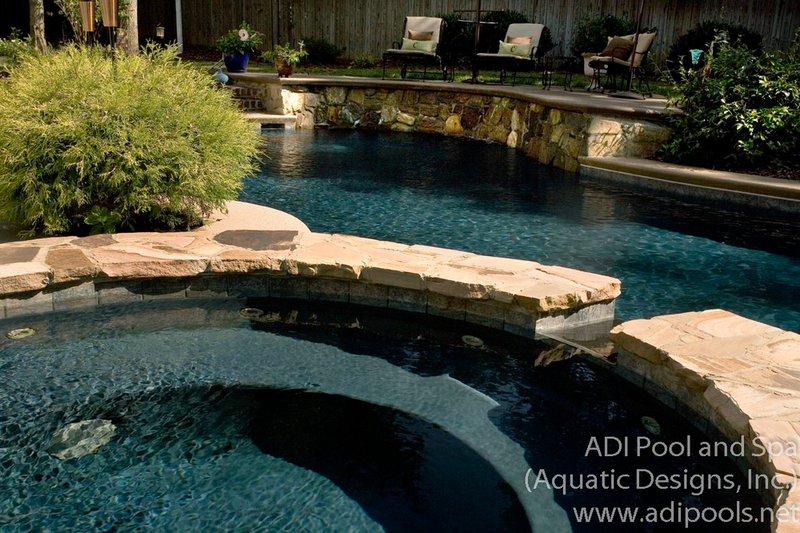 Give us a call if you need a pool designer or pool builder in Lewisville or around Winston Salem. 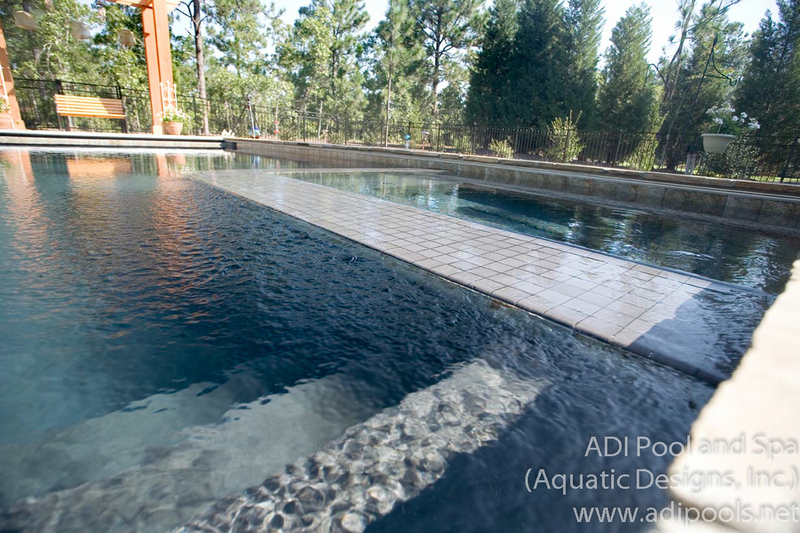 ADI Pool and Spa (Aquatic Designs, Inc.) designed and built this beautiful residential vanishing edge pool at the Governor's Club in Chapel Hill, NC. This project features a dark finish plaster pool with a vanishing (or infinity) edge that encompasses more than half of the pool perimeter leaving a glass like pool that reflects much of its natural surroundings. 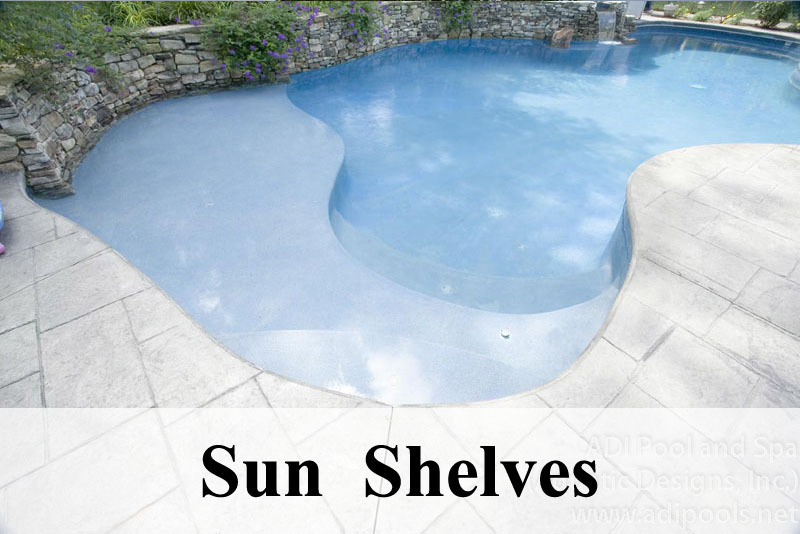 The pool also features an in floor cleaning system, travertine coping, high efficiency pool heater, and complete pool automation for one touch access to all the pools features. 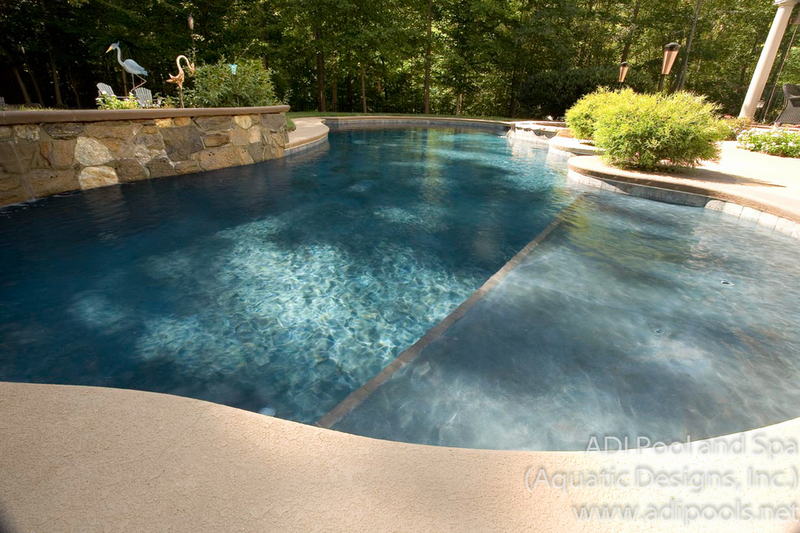 Contact us for all your pool and spa needs in or around Chapel Hill, NC. 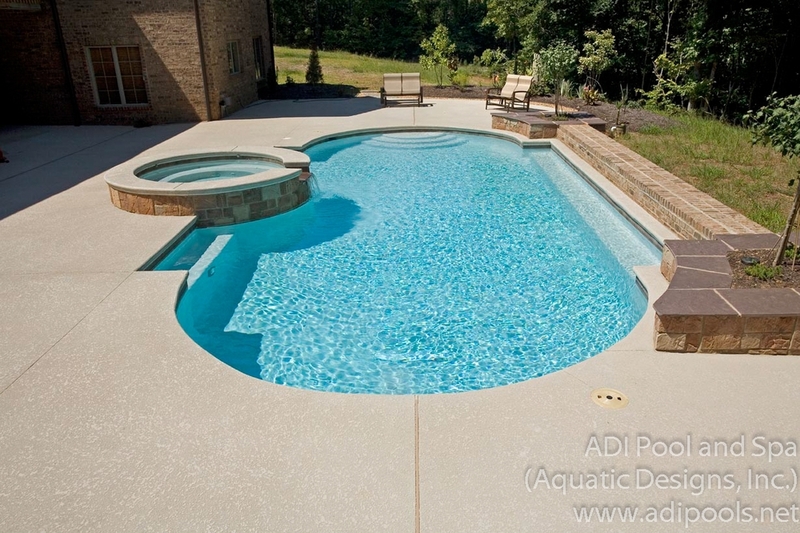 The homeowner in Mebane, NC (near Burlington) chose ADI as their pool designer and pool contractor. 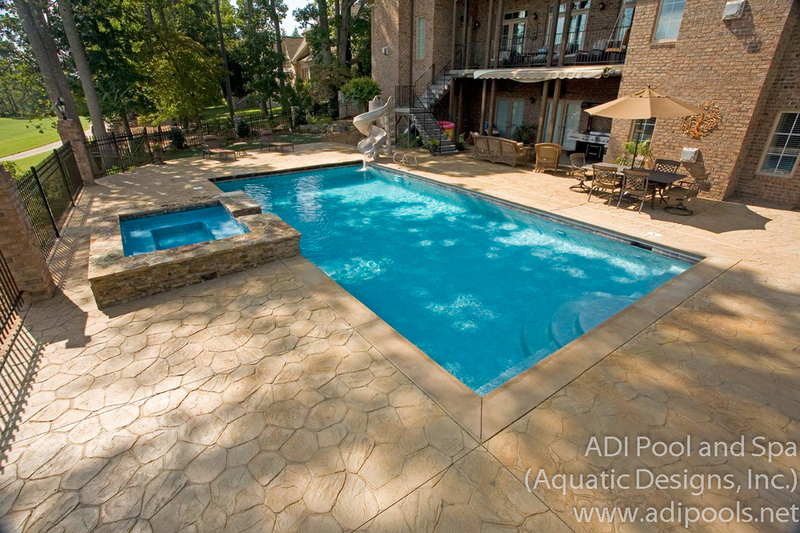 This project features both a pool and a spa with separate filtration systems. 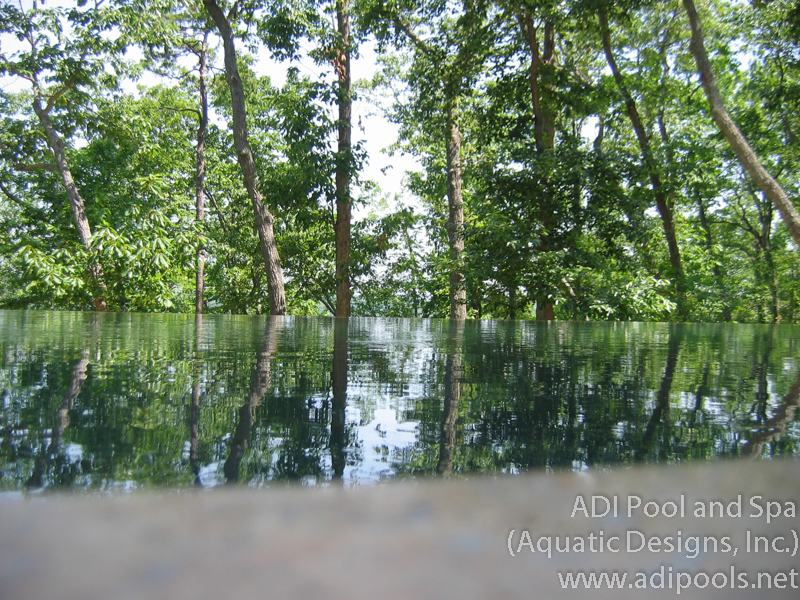 The pool features a vanishing edge wall over 50' long and more than 10' high. 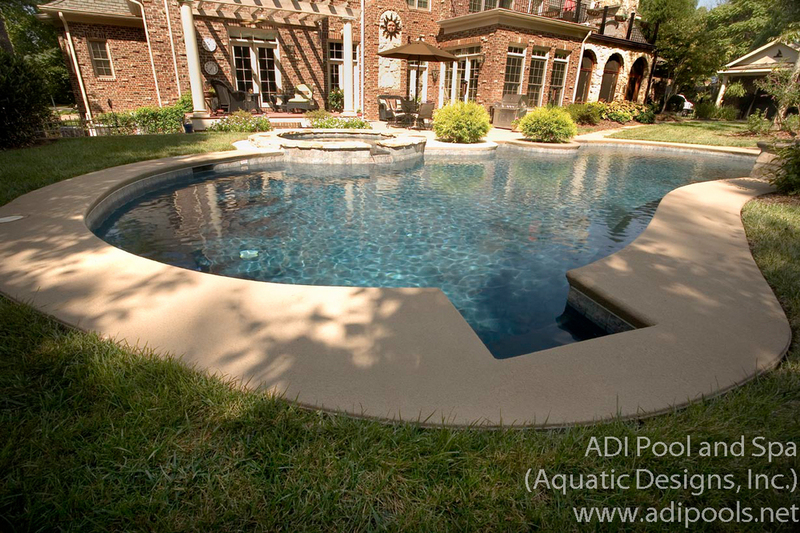 The entire pool and spa are raised out of the ground by 18" creating a distinct appearance and also providing a seat when the owner's entertain guests. 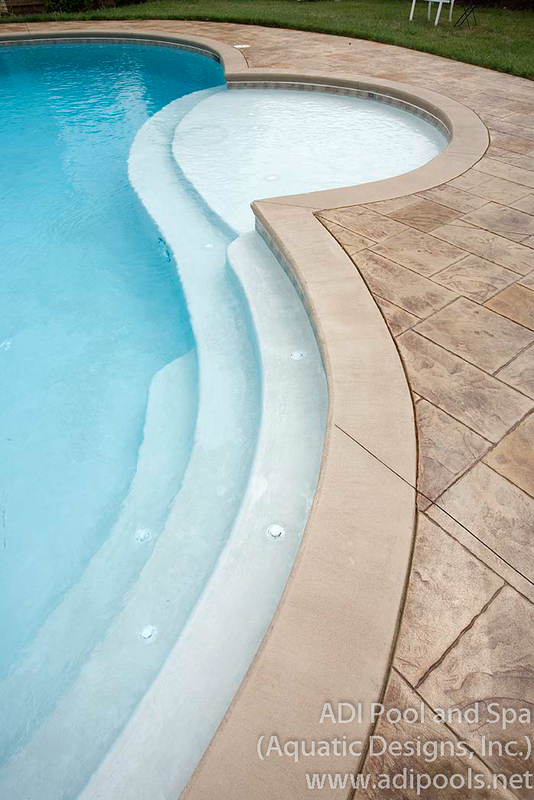 Th epool and spa both have custom cut travertine coping matching the travertine deck. Other features on this project are saline generators, over 1500 sq. ft. of cartridge filter area, dual chemical controllers, high efficiency heaters with almost 1 million btu output for fast heating, in floor automatic cleaning system, complete pool automation with a handheld remote, home automation tie and remote access from anywhere in the world. 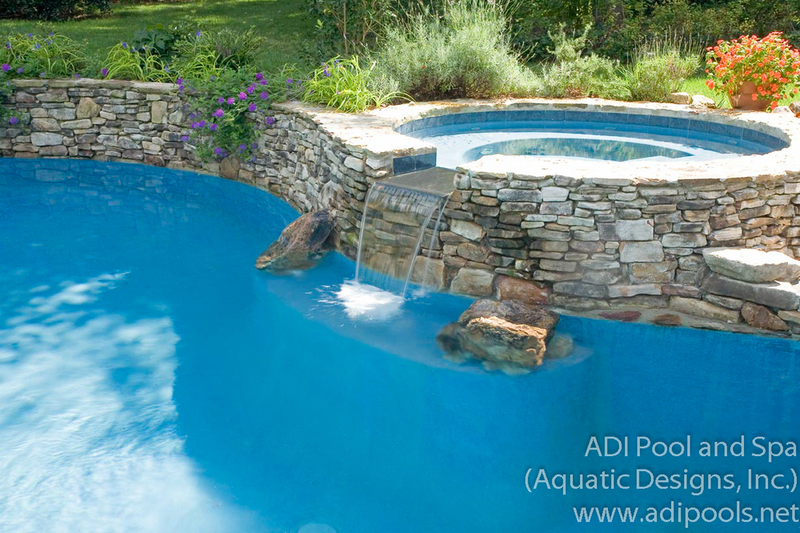 This swimming pool and spa in Greensboro, NC built by ADI is a backyard escape. 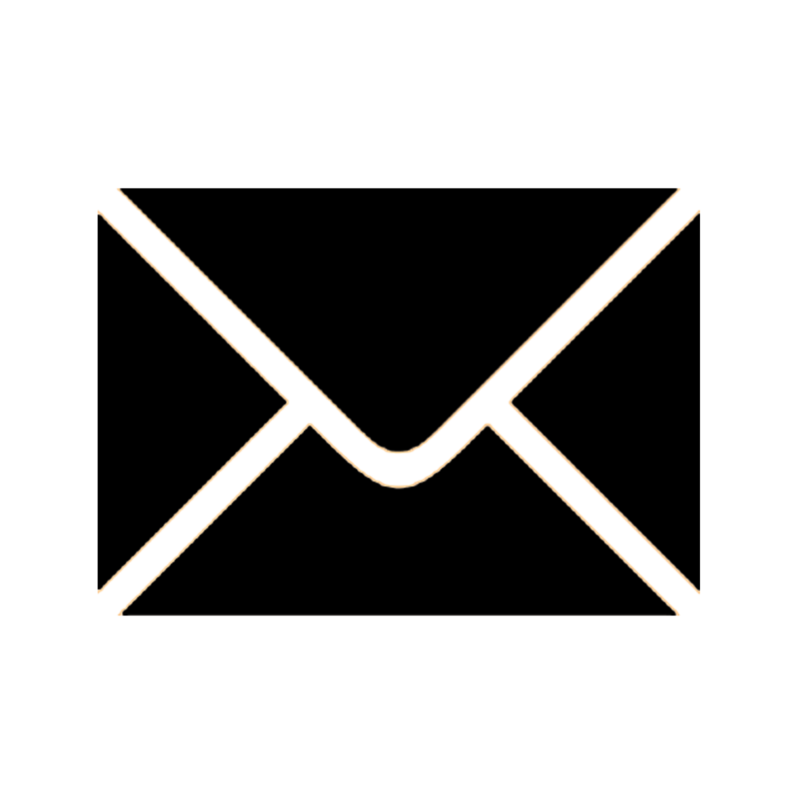 The pool features in floor automatic cleaning system, bubblers on the sunshelf and a swimout at the deep end, a raised stone wall with continuous water flow for a relaxing audible experience with minimal visual intrusion. The spa is raised above the pool with a natural stone surround and the deck is a pattern of cool deck topping on multiple elevations with planters spaced around the pool. 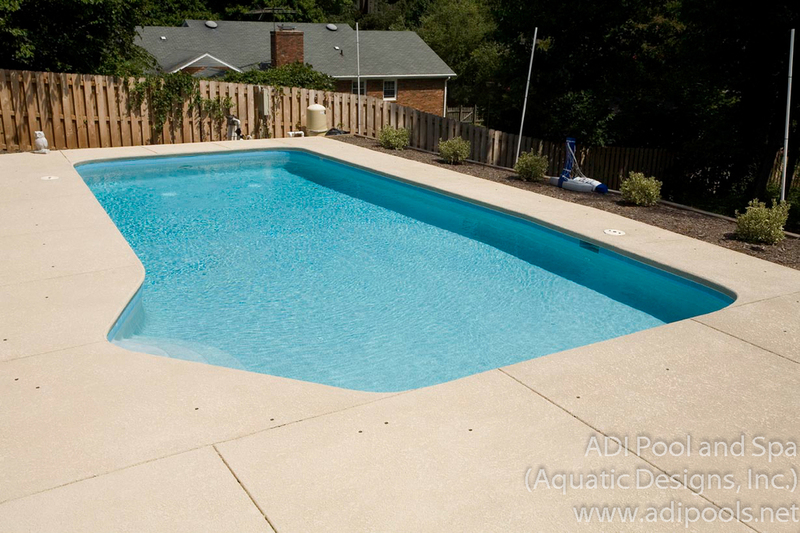 The pool also features a saline generator, and complete automation for one touch access to all the pool features. 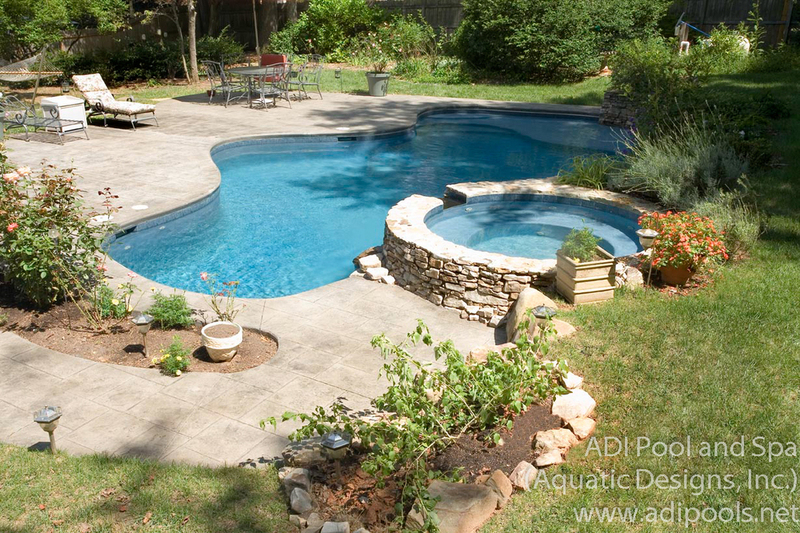 ADI was chosen as the pool contractor to build this simple backyard pool in Greensboro, NC. 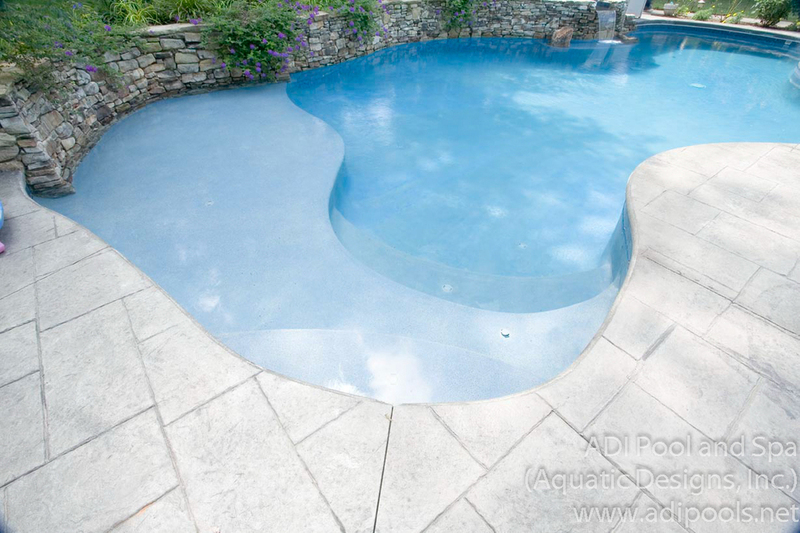 The pool features a surrounding deck of knockdown concrete, in floor cleaning system, salt chlorinator, a custom winter safety cover, and complete swimming pool automation. 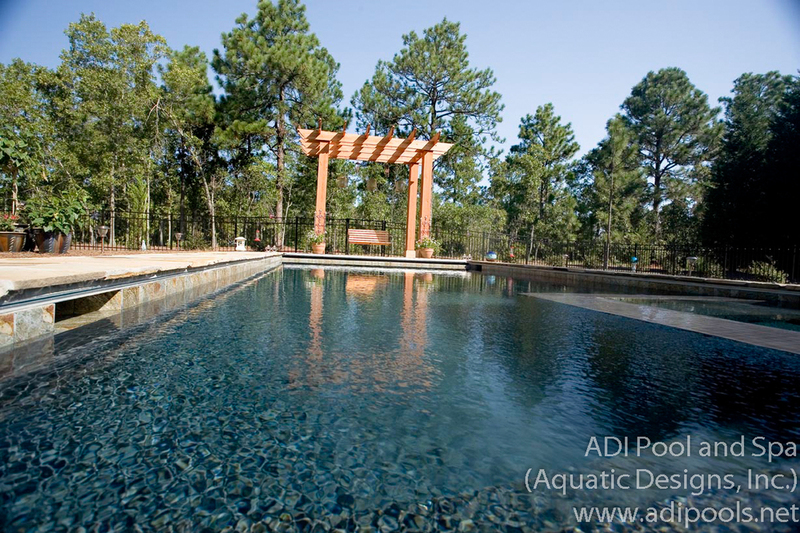 ADI was selected as the pool designer and contractor for this project. When we started this project there was an existing vinyl liner pool in the back yard that didn't meet the owner needs and caused continuous trouble for them. 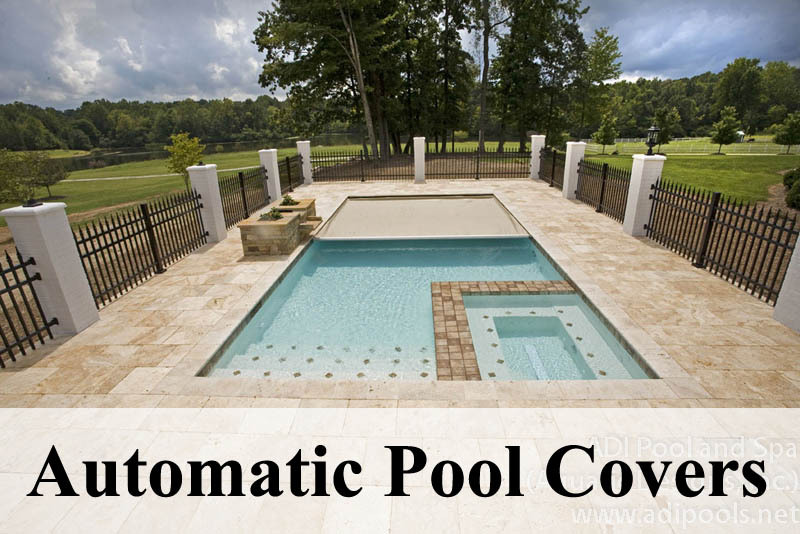 We demolished the existing pool and deck and in its place put this pool and spa combination with automatic cover. 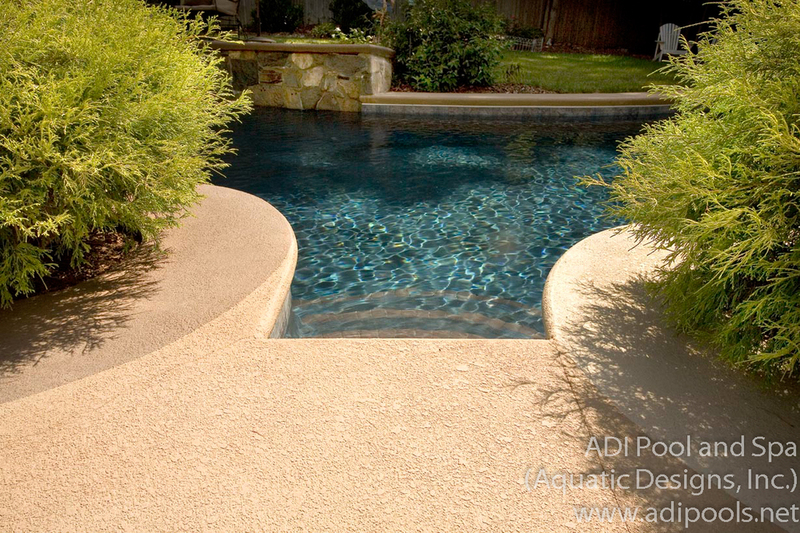 The pool has a beach entry of field stone that provides easy access both for the homeowner and their dogs. 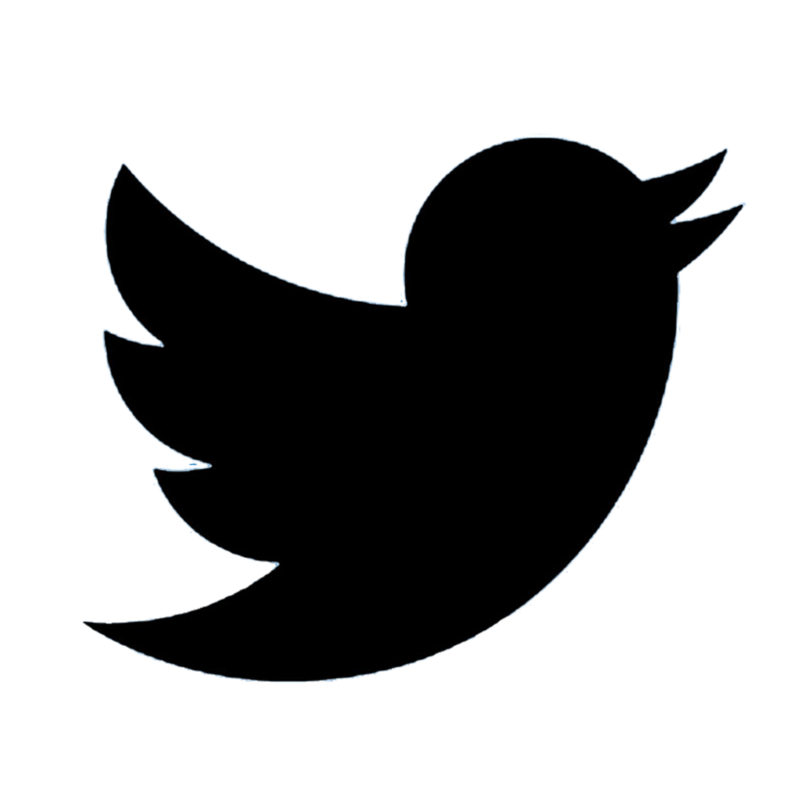 The system features an in floor cleaning system, salt generator, complete pool automation, and variable frequency pool pumps for energy efficiency. 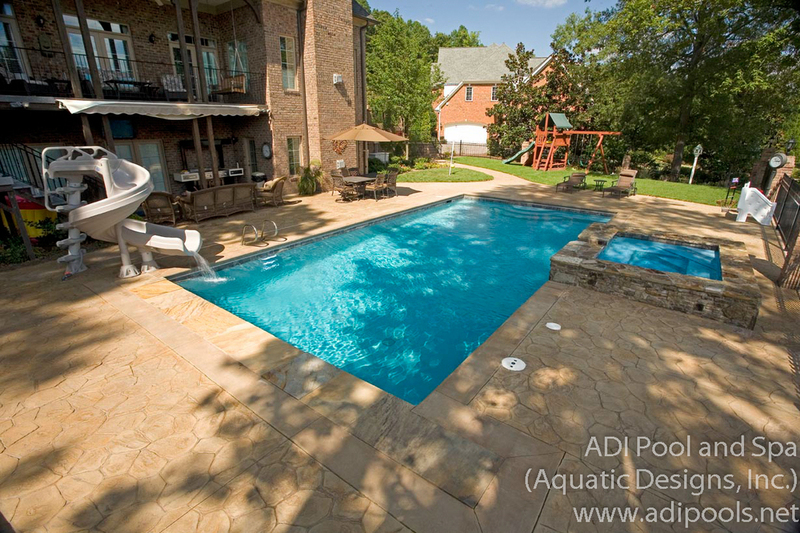 Located in Burlington, NC this backyard pool was designed and constructed by ADI. 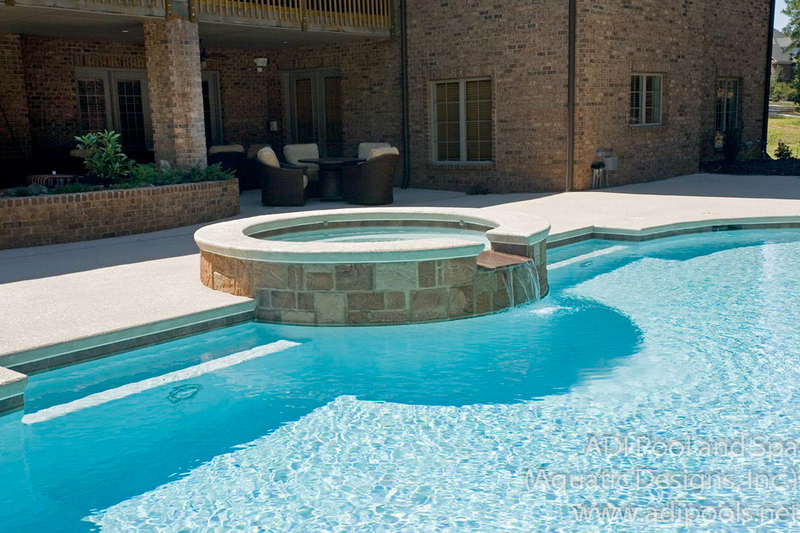 The pool features a 7' deep end, a swimout, multiple pool benches, custom pool steps, and a large sunshelf. 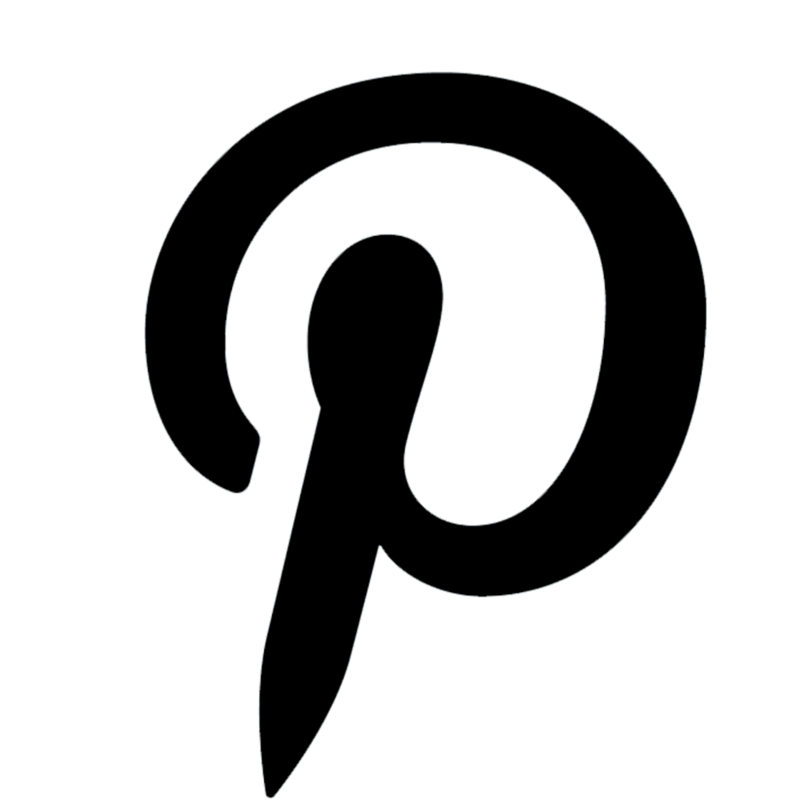 The pool also features an energy efficient variable frequency drive pool pump, automatic fill device, colored LED underwater lighting, and a salt chlorinator. 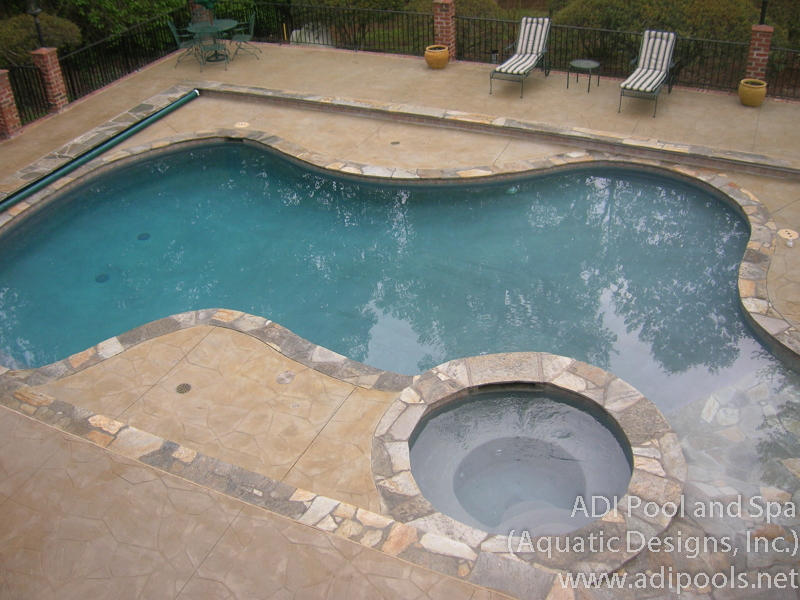 The deck on this pool is stamped concreate with a differentiated border. 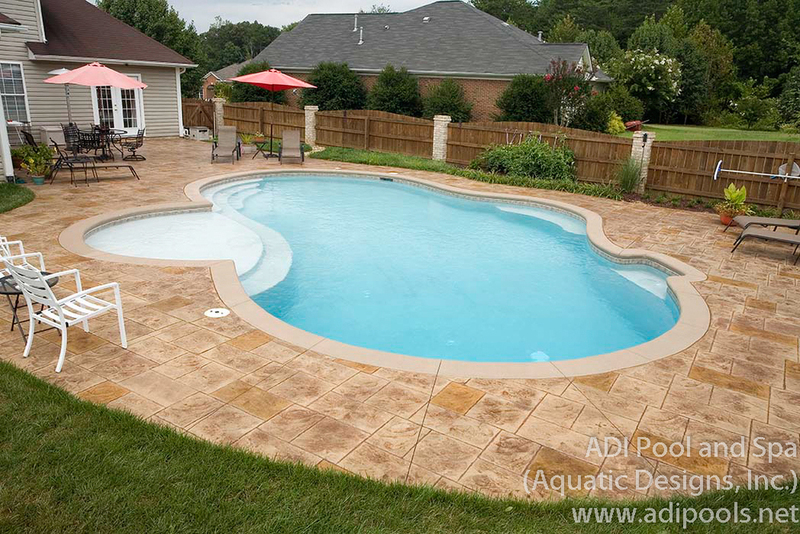 ADI was selected as the pool contractor for this pool and spa combination at Grandover located in Greensboro, NC. 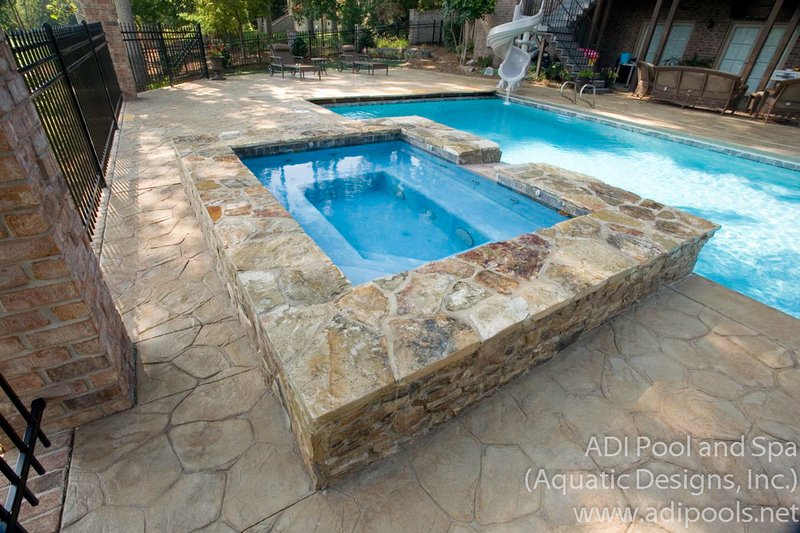 This pool features an automatic cover, a waterslide, a raised spa with stone surround, and an in-floor cleaning system. On the back end the pool is powered by a vfd pump for energy efficiency, a saline chlorinator, and complete automation for one touch access to all the pool features.The pool deck is a stamped concrete with a perimeter border at the pool for contrast with a stone lid for the cover trough. 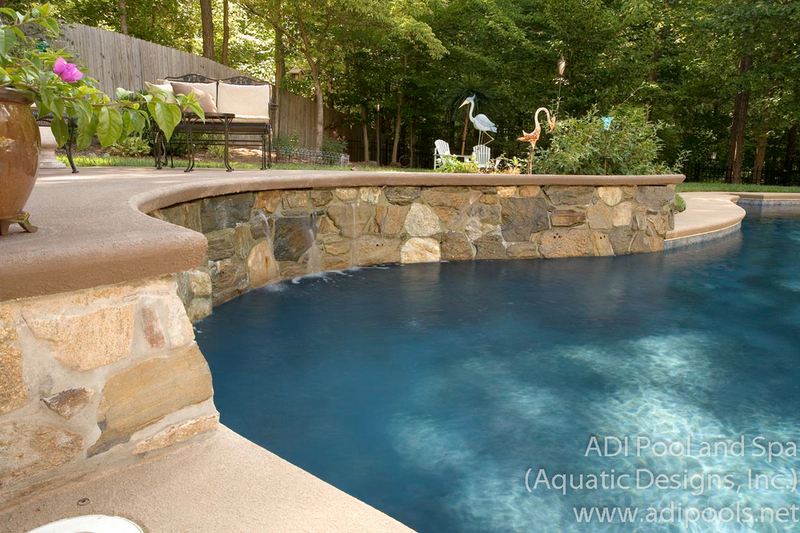 This backyard pool spa located in Pinehurst, NC has a sunken spa, an automatic cover, dark plaster finish, fieldstone decking, an automatic cleaner, a super high efficiency variable frequency pool pump, saline sanitizer, and complete pool automation. 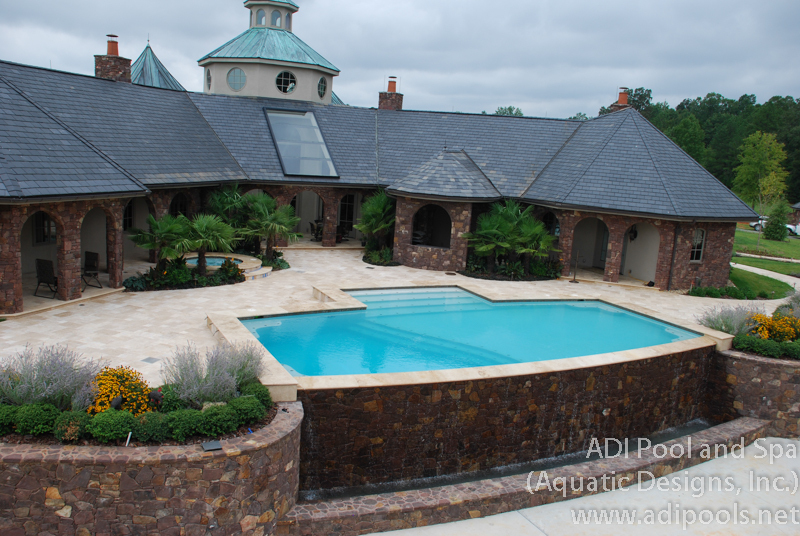 When ADI was selected as the pool contractor for this beautiful pool in Roxboro, NC we were asked to minimize the owner's time involved in maintaining the pool. 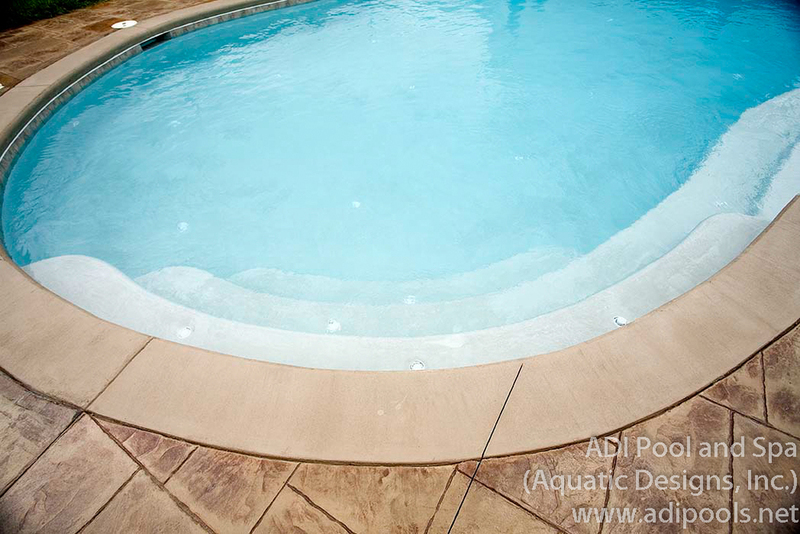 The pool features an automatic cover allowing the owner to open and close the pool with the touch of a button, a small water feature with planters, a sunken spa that slides under the pool cover, an in-floor cleaning system, a salt chlorine generator, a chemical controller, and complete pool automation including remote access from anywhere in the world, The pool coping and pool deck are both stone travertine providing a cool to the touch and elegant finish. 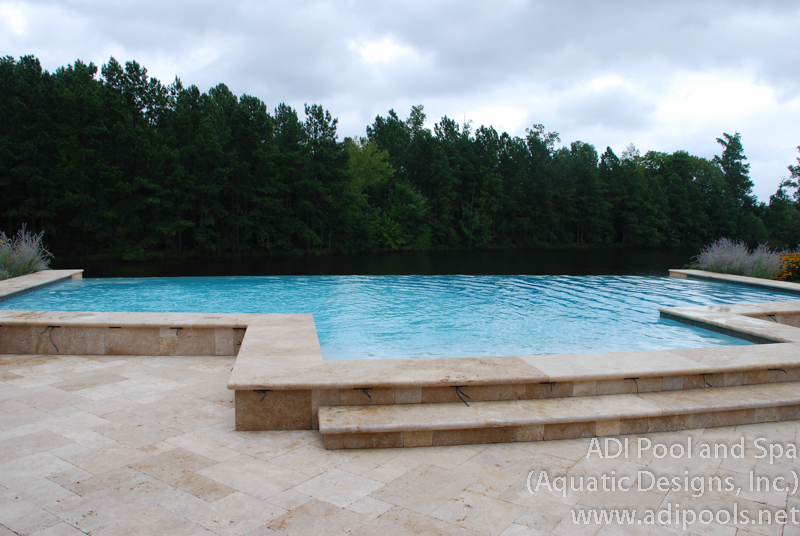 ADI was chosen as the pool designer and pool contractor for this pool project in Greensboro, NC. 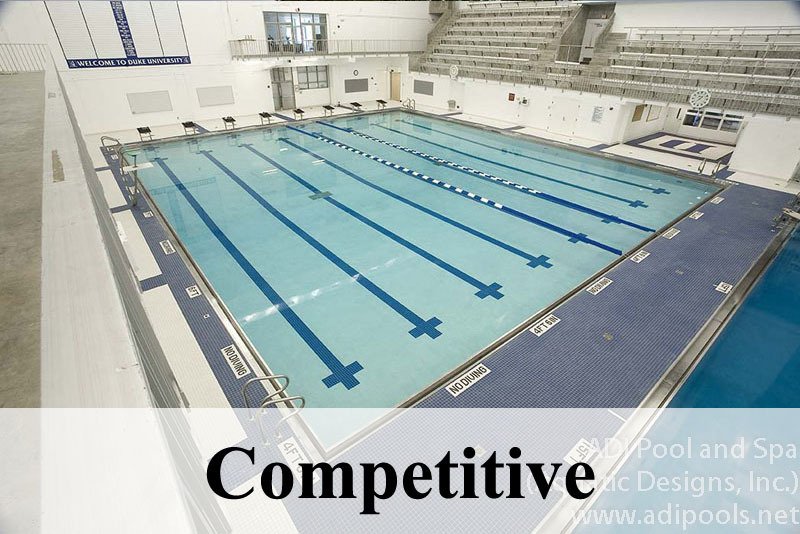 We designed this project to include an in-floor cleaning system, a high efficiency heater, a salt chlorine generator, and a high efficiency variable frequency pool pump. 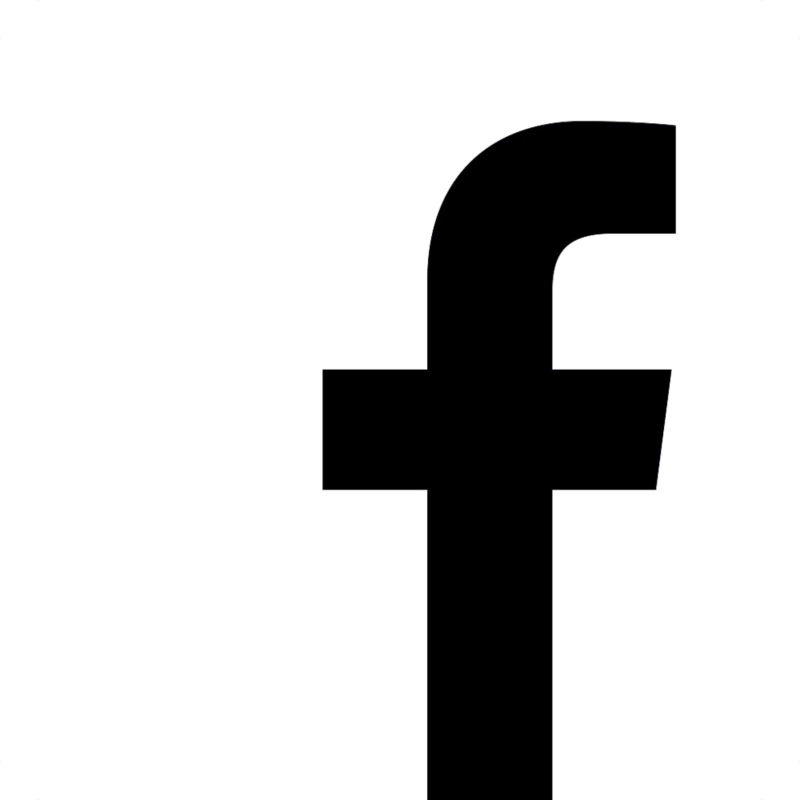 The project also features a free-form pool with a built in retaining wall covered in natural stone, a raised spa with spillway, a large sunshelf, and stamped concrete pool deck.